What did we expect? Hike in a swamp in the middle of the summer, and there’s going to be something trying to land on us. In this case, deerflies in Skegemog Swamp. My family was hustling down the trail, each of us waving one hand above our head in an attempt to keep these voracious flies from landing, when suddenly we all put on the brakes. Whoa! Red dots along the trail, thousands of them, which could only mean one thing. Raspberry heaven! We were the fastest one-armed pickers you ever did see. Besides being a wild berry paradise, Skegemog Swamp is also one of the most scenic wetlands in Michigan with one of the driest trails to it. The area is protected as the Skegemog Lake Wildlife Area, a preserve of 2,700 acres that was saved from developers by the Michigan Chapter of The Nature Conservancy working with the Department of Natural Resources and Environment. There are several viewing points of this sensitive area, including Skegemog Overlook, a roadside park on M-72 8 miles west of Kalkaska, where you can enjoy lunch while viewing the lake. But for the best view of the wetlands that border the lake, hike the Skegemog Swamp Pathway, an easy 1-mile walk out to an observation tower that is also referred to at times as Skegemog Lake Pathway. The pathway is an interesting adventure anytime of the year, but bring bug repellent in the summer, and binoculars during the spring and fall, to watch the migrating waterfowl. The pathway passes through three distinct habitats. From the parking lot, you enter a predominantly beech forest, carpeted in ferns, and then arrive at a former railroad grade. A lone trail marker directs you south along the old railroad bed for 0.5 mile to a bridge leading into the woods. It’s along the open, meadow-like terrain of the rail-trail where the raspberries can be thicker than the deerflies. The final habitat is the lush woods of a cedar swamp. Here the trees were primarily cedar, spruce, and tamarack, which grow well in the bog-like conditions and shade a forest floor carpeted in moss, wintergreen, and wildflowers earlier in the summer. Jack-in-the-pulpit, with its white flower in the green pulpit, is one of the easiest flowers for children to recognize. There are also Canada mayflowers, grass of Parnassus with its flower of five white petals, and great blue lobelia with its delicate bluish-purple flowers. The trail follows a stream through the woods and consists of a boardwalk with scattered benches much of the way. Toward the end you cross the stream on a bridge and shortly emerge into the open area of cattails and marsh grasses, with the observation tower at the end of the boardwalk, 0.5 mile from the railroad grade. 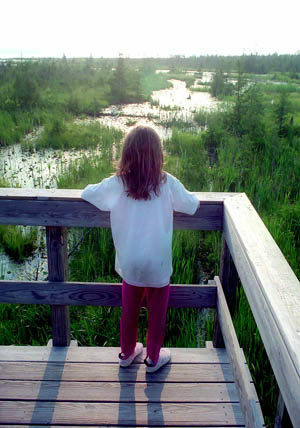 The tower is 16 feet high and provides a sweeping panorama of Skegemog Swamp, a maze of open-water channels and patches of cattails and other shrubs. On the horizon is the edge of the lake, and with the aid of binoculars you can often spot a variety of bird life, including Canada geese, egrets, great blue herons, a variety of waterfowl, and, if you’re lucky, a bald eagle or osprey fishing along Skegemog Lake. Other wildlife that is occasionally spotted from the tower or even the boardwalk are otters, mink and beavers. Skegemog Swamp Pathway contains a trailhead information board at the parking area and an observation tower at the end. 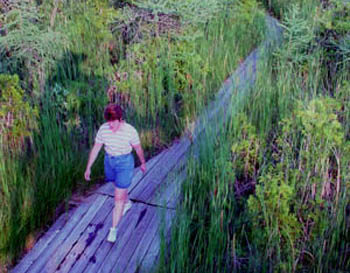 Skegemog Swamp Pathway is open year-round and there are no entry or vehicle fees. From Kalkaska, head west on M-72 for 4 miles and then turn north on County Road 597 (Rapid City Road) toward Rapid City. 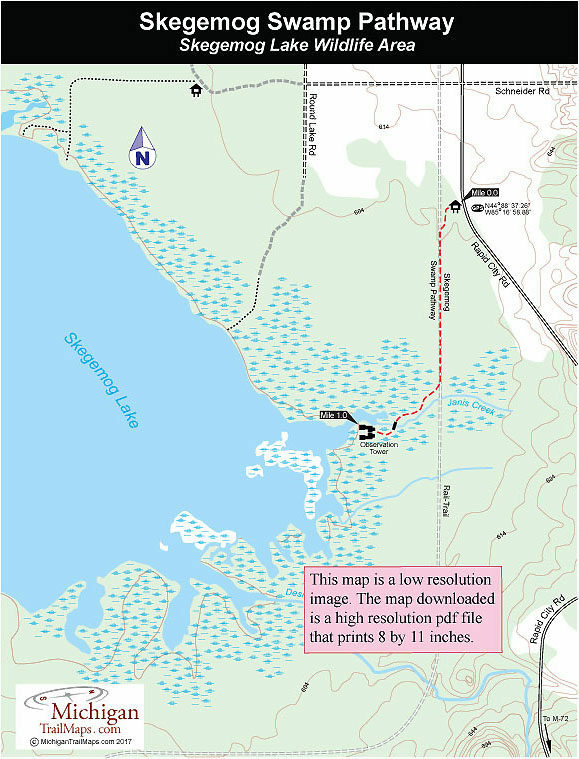 Within 3 miles you will see the posted trailhead and parking area on the west side of the road for Skegemog Swamp Pathway. Contact the Kalkaska office of the Department of Natural Resources and Environment at 231-258-2711.